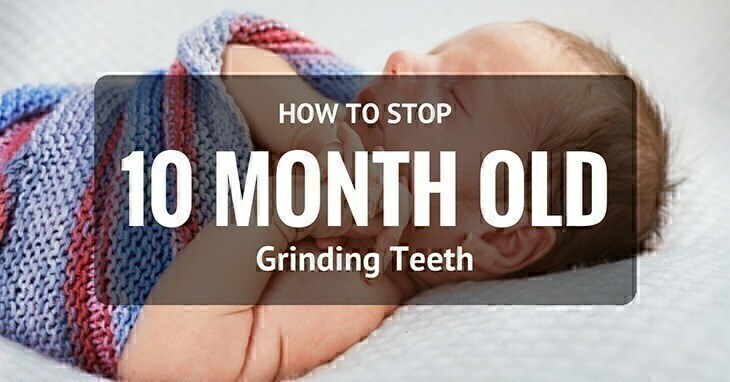 →10 Month Old Grinding Teeth: How To Stop And Intervene? Just the other day, a friend came by for a play date with our two toddlers. While the little boys were playing, we were having a typical mom chat mostly about our tots too. Visits like these are usually the time when we share problems we encountered or some milestones they have achieved. And so, she told me about her 10-month-old grinding teeth. I remembered when I was still in nursing school, and we discussed teeth grinding or bruxism. When it occurs in adults, it’s mostly caused by stress or anxiety and often happens during sleep. It’s also associated with other sleep disorders like snoring or worse, sleep apnea. BUT what does it mean when it happens to your wee one? Is it serious? Will it require medical intervention? What can you do to lessen or stop it? It could be their way of coping with stressful situations, or it might be something they do when they’re feeling anxious. But while there’s no actual cause, experts have agreed that it might have something to do with their earaches, sore ﻿﻿gums﻿﻿, teething pain, breathing problems caused by a stuffy nose, or a bad bite (malocclusion). It’s not exactly something to be alarmed of because it’s fairly common to those whose teeth are just about to erupt, around 5-6 months. Of course, you can’t help but worry because it may sound awful and may even seem scary. What if my baby has trouble breathing? What if they're in pain? What if it damages their teeth? There are those who reported that it sounded so loud, you can hear it in the other room! But take note, it even happens to kids who are beginning to have their permanent teeth (average age of 6 years old). 15-33% of children do this! So it’s not that alarming. Still, as parents, we are always alert for anything unusual with our kids. There may be few problems that could result from teeth grinding. However, it may also cause jaw pain (especially when they bite down hard), temporomandibular joint disorders and some wearing on the teeth. Again, these rarely happen which is why you need to have their teeth checked regularly and also ask them whether they’re feeling any pain. Nevertheless, since they grind their teeth for pain relief, chances are it will die down once all their teeth have appeared. 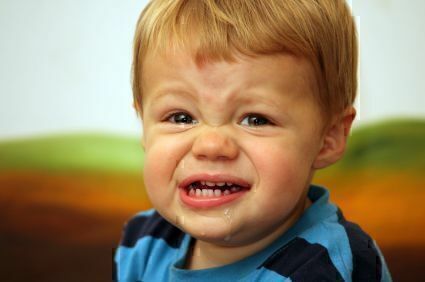 Although most of the time teeth grinding happen subconsciously, it can also happen while the tot is awake. They will eventually grow out of it, but I know “There’s nothing you can do” is the last thing you want to hear. You can bring them to a playhouse at the mall so they can socialize with other kids OR you can just play with them. Nothing beats anxiety faster than a fun activity. You can read books on the porch, go to the park or spend an entire day at the beach! One of the most common reasons why babies grind their teeth is because they want relief from the pain in their gums. They’re still getting used to having the teeth, remember they had nothing but soft gums for months, so it’s a new sensation and not altogether pleasant. Besides, grinding relieves any pain. You can help by rubbing the sharp edges probably with a wet washcloth, moistened gauze or just a clean finger. Put a warm cloth near the affected ear to relieve the pain or swelling. If there’s no improvement in a few days, NEVER self-medicate or use ear drops which were not prescribed by the doctor. Don’t second-guess. As parents, it’s inherent in us to know when something’s wrong so if you have this feeling, don’t wait for the condition to worsen. Contact your family physician immediately. Pinch the bulb and put the tip inside the nostril but DO NOT go too far down since it may cause more harm than good. Stop pinching the bulb so it can suction the mucus. Rinse with clean water after every use. Please be very careful when doing this, though. My son starts wiggling when he can feel the tip of the bulb, and it can be dangerous if he moves about while you’re suctioning. What I do is, calm him or distract him so he won’t move while I’m removing the mucus. Keep a cool air humidifier during colder months to prevent nose stuffiness in your baby. Take notice if your little one is feeling any pain from the teeth to the jaw. Check with your dentist. Although it’s not extremely serious, it’s still recommended to tell your dentist about your kid’s teeth grinding so he can check if there are any dental problems. Most experts and doctors would say you just have to wait for them to grow out of it since they will eventually stop with their teeth grinding. But moms never want to do ‘NOTHING’ when their little one is not feeling well, or there's any discomfort. But then again, the least we can do is give them all the support we can give. Again, I'd like to emphasize that you should avoid scolding them. It's not the way to go. So, is your baby grinding his/her teeth too? Share your experience (and how you dealt with it) in the comments.